Practically invented in the Florida Keys flats fishing is the ultimate collection of hunting and fishing combined in one experience. Add the back drop of the inshore backcountry waters of the Keys and you have an incredible fishing experience that might become quite addictive. Enjoy the day sight fishing in the shallows for species such as tarpon, permit, bonefish, redfish and snook. Also called Bonefishing, Flats fishing opens the term up for more species of fish. A definite "bucket list trip" for any angler. We can set you up with the right flats fishing guide for what you would like to do and how you would like to fish. We have professional flats fishing guides that will take you fishing out of Islamorada, Big Pine Key, Sugarloaf Key and Key West. Flats fishing is allot like backcountry fishing only a little bit more focused and diciplined and on a smaller boat. Fishign the same areas of shallow water with a specific species or technique of fishing in mind. Traditional flats fishing skiffs have the anglers on the bow of the boat and the fishing guide is on the back of the boat maneuvering his anglers into position using a long push pole. On a flats fishing charter, anglers are left to thier own capabilities and not much help from the fishing guide is offered outside of direction and distance to cast. Accuracy is very important when casting either spin fishing gear or fly fishing gear while flats fishing. A moments notice is all you get sometimes when your targeted fish comes into range. For a less challenging and possibly more rewarding experience on the flats, look into our Florida Keys backcountry fishing charters. 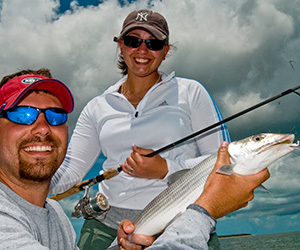 Our Florida Keys Flats fishing guides will take you to the fish and show you how to catch them using state of the art flats fishing boats, rods, reels, tackle and techniques. Spin fishing or fly fishing - your choice. Your fishing guides job is to quietly maneuver his angler into position to get a shot and cast to the fish. You make the cast, the fish eats and zing! the race is on. 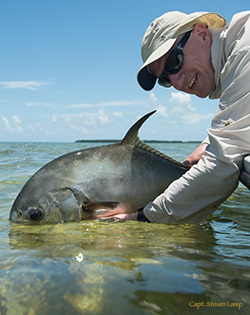 A true trophy of fishing is a fish caught fishing the flats of the Florida Keys. Flats fishing boats only all for 2 persons or less per boat, not only due to the size of the flats boat but also the intensity of the fishing. Our flats fishing guides offer 4, 6, and 8 hour charters. We reccomend 6 hours or less being the best deal. Rates start at 450.00 for 4 hours. All of your tackle, licenses and instruction will be included. This includes fly fishing gear, bait, flys, spin tackle, artificial lures, bottled waters and some ice to keep your drinks and lunch cool. We reccomend that flats fishing anglers have some experience casting with light tackle spin fishing rods or moderate experience casting saltwater fly fishing rods to get the most out of a flats fishing charter. Those with less experience wanting to fish the flats we reccomend our Florida Keys backcountry fishing charters on board our bay boats. Join the Crew of Florida Keys Fun fishing, directed by Capt. 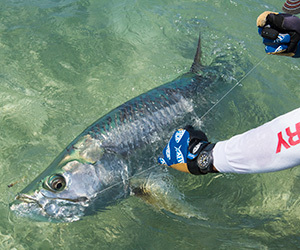 Mark Johnson for Bonefishing, tarpon fishing and fly fishing on the flats of Islamorada and Everglades National park areas. Fishing done right! Flats Fishing with the seasoned captains in the Florida Keys. Specializing in Tarpon fishing, bonefishing, and fly fishing year round. Veteran Florida Keys flats fishing guide Capt. Chris Duncan. Specializing in Tarpon fishing, bonefishing and fly fishing year round. Veteran Key West flats fishing guide Capt. Steven Lamp. Specializing in Tarpon fishing, bonefishing and fly fishing year round.